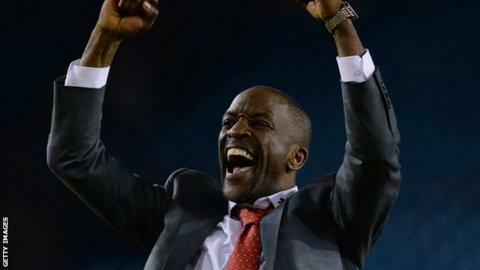 Huddersfield boss Chris Powell is the one of only two black managers in English football, along with Keith Curle at Carlisle. Football has a "hidden resistance" preventing black managers getting jobs, says players' union boss Gordon Taylor. The Professional Footballers' Association chief executive said the Football League failed to fulfil a "promise" to discuss the 'Rooney Rule' introduced in American football. The rule has been credited with an increase in black coaches in the NFL. "You see so many black players on the pitch, yet we have two black managers out of 92," said Taylor. In a wide-ranging interview with BBC Sport, the players' union chief executive spoke about a lack of black managers in the English game and the difficulties in getting more home-grown players into Premier League teams. Discussions took place last year about introducing an equivalent rule in English football called the Coaching Fair Play scheme. But with Chris Powell at Huddersfield and Carlisle's Keith Curle the only black managers currently employed within the 92 clubs of the Premier League and Football League, Taylor now wants the 'Rooney Rule' to be introduced. "There is a hidden resistance," he said. "We approached the Football League in the first place. Greg Clarke, the chairman, promised to bring the 'Rooney Rule' up at their  annual general meeting and, for one reason or another, the issue was not even raised. "You see so many black players on the pitch and yet we have two black managers out of 92. "The whole recruitment process needs to be more professional, more diverse and, equality-wise, fairer. We've struggled to do that." "Football's our major sport, it makes a massive contribution to the economy. "We've looked to the government for help with stadiums when we had problems with hooliganism and safety at grounds, and we've set an example to the rest of the world. We've got state-of-the-art stadiums. "We need to look to government with regard to greater equality in football at managers and coaches level and also with regard to youth development level." "Six hundred players a year get taken on at the age of 16 by clubs in the Football League and Premier League. Of those, 500 are out of the game by the time they're 21. "If we were a university, our youth development programme would be turned down, if not closed down, because the success rate is just not good enough. "They're hitting a glass ceiling." "I'm concerned we're becoming a finishing school for other countries. "Politically and as a nation, we have a duty to encourage the younger generation to aspire to become professionals and see some light at the end of the tunnel. "There have been moves now for some years to look at home-grown players, irrespective of nationality, who've been with a club from 16 to 21 for at least three years - the definition of a home-grown player - to be in a squad of 25. "We should be talking about four home-grown players in the starting line-up, and one of those players to be club-grown as well. That would be an incentive for clubs to make sure they are doing all they can to give youngsters a chance. "But the issue is so serious now that we need to be a lot more direct and positive and clear." "The fact is for many years now we've seen our young players do well, get to 19, 20, 21, and suddenly disappear from the game. "We're buying from abroad - in the last transfer window there was some £850m spent. "There's a trade deficit for football. That's a great deal of money leaving this country which could be used for facilities for the future." "In the World Cup England fans didn't have high expectations and unfortunately they were realistic expectations. "In any sport, the real litmus test is how we do at international level. "In football we're settling too easily for saying we've got a good league system and it's all about the Champions League. "We've come to have such low expectations of our national side and yet in Germany there's such a combination between the league and the country for Germany to do well. "These are key football issues. If we can't get them addressed within the game properly then we'll go to government and see if they can address them at that level."